Four-time Oscar-winning filmmakers Joel Coen and Ethan Coen (No Country for Old Men, True Grit, Fargo) write and direct Hail, Caesar!, an all-star comedy set during the latter years of Hollywood's Golden Age. Hail, Caesar! follows a single day in the life of a studio fixer who is presented with plenty of problems to fix. Today, we have the all new trailer along with a new poster and several photographs. The comedy is produced by the Coen brothers under their Mike Zoss Productions banner alongside Working Title Films' Tim Bevan and Eric Fellner. The writer-directors' latest project reunites them with stars they have worked with in the past, such as Josh Brolin (No Country for Old Men), George Clooney (O Brother, Where Art Thou? ), Tilda Swinton (Burn After Reading), Scarlett Johansson (The Man Who Wasn't There) and Frances McDormand (Fargo). Universal Pictures is releasing the movie on February 5, 2016 where it will go up against Sony's Pride and Prejudice and Zombies. The supporting cast is rounded out by Ralph Fiennes, Channing Tatum, Jonah Hill, Alden Ehrenreich, Patrick Fischler and David Krumholtz. Joel Coen and Ethan Coen direct from their own screenplay, and produce under their Mike Zoss Productions banner alongside Working Title Films' Eric Fellner and Tim Bevan. The Coen Brothers also wrote the screenplay for Steven Spielberg's latest film Bridge of Spies, which came out last October and looks to be giant Oscar contender. This isn't the first time the Coen brothers have tackled the Hollywood studio system. Their 1991 film Barton Fink explored the life of a playwright turned Hollywood screenwriter, played by John Turturro. As of now, the comedy has very little competition at the box office, so it very well could become an early hit when it hits theaters next year. Lights. Camera. Abduction. That's the clever tagline given to the new one-sheet for Hail, Caesar!, which shows George Clooney being carried off to parts unknown. Taking a cue from movies of a bygone era, the poster also gives us a new look at some of the other big name members of the cast. Will this be another classic for the Coen brothers? We'll know in just a few short weeks. 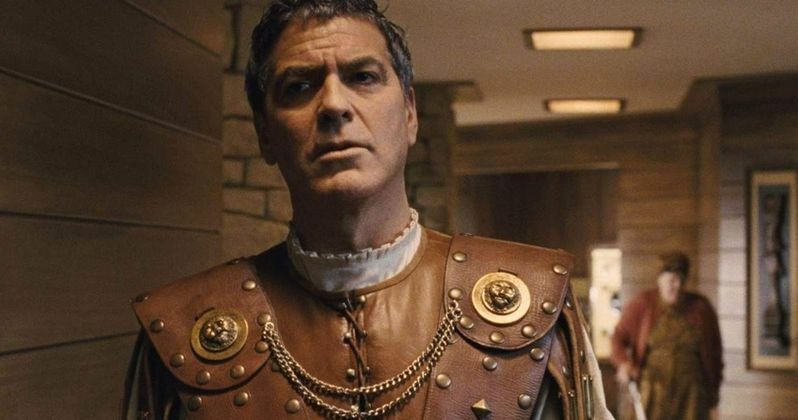 Check out all of these new riches from Hail, Caesar! and be sure to reserve your tickets today!